Index heavyweight Reliance Industries was quoting at an all-time high of Rs 1,304.30. 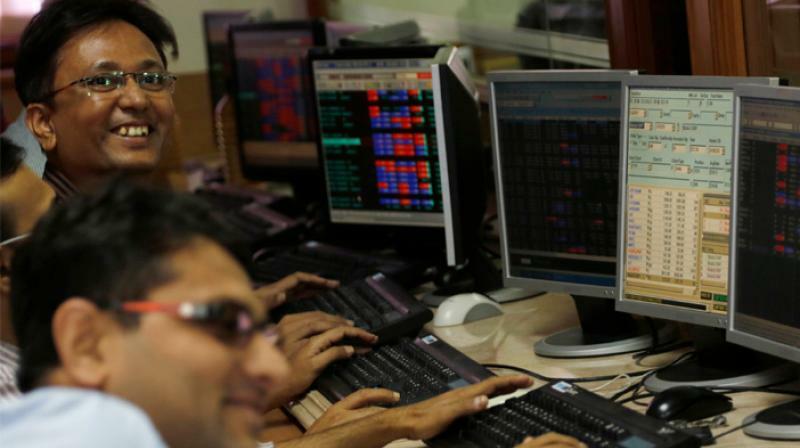 Mumbai: Benchmark indices continued their record-setting trend for the second straight session with the BSE Sensex soaring 182 points to an all-time high of 38,875.86 on heavy buying by foreign funds and domestic institutional investors, tracking strong global markets. The broader NSE Nifty too hit a record high of 11,751.20. Trading sentiments remained extremely bullish largely in tandem with a firm trend at other Asian bourses, taking another record lead from Wall Street as investors cheered news of trade deal between the US and Mexico. Sentiment also got a lift following an improvement in liquidity in the market on fresh inflows by foreign funds, brokers said. Strong gains in metal, power, teck, healthcare and IT, fertilisers and sugar stocks lifted the key indices to new highs. The 30-share index surged 181.75 points, or 0.46 per cent, to trade at an all-time high of 38,875.86, surpassing its previous high of 38,736.88, recorded in yesterday's trade. The gauge had gained 442.31 points yesterday to close at record high of 38,694.11. All sectoral indices led by metal and power packs were trading in the positive zone, rising up to 0.95 per cent. The NSE index Nifty too hit a new high of 11,751.20 by gaining 59.25 points, or 0.50 per cent. It also breached previous record of 11,700.95 (intra-day) hit yesterday. Other top gainers that lifted the key indices were NTPC, Coal India, Vedanta, Sun Pharma, Asian Paints, Tata Steel, PowerGrid, ONGC, IndusInd Bank, Kotak Bank, HDFC, Tata Motors, Bharti Airtel and TCS, gaining up to 3.37 per cent. Domestic institutional investors had bought shares a worth a net of Rs 1,117.24 crore, while FIIs accumulated equities to the tune of Rs 252.52 crore yesterday, provisional data showed. Elsewhere in Asia, Hong Kong's Hang Seng was up 0.27 per cent, while Japan's Nikkei rose 0.39 per cent and Shanghai Composite Index gained 0.01 per cent in early trade today. Meanwhile, the US Dow Jones Industrial Average ended 1.01 per cent higher yesterday.